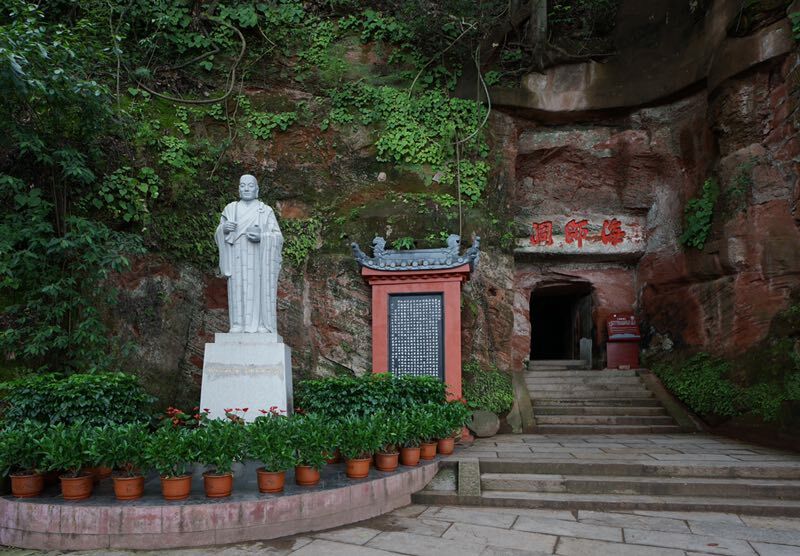 Shufengyayun, located in Chengdu Culture Park on Qintai Road, is the ideal place to experience the local arts. 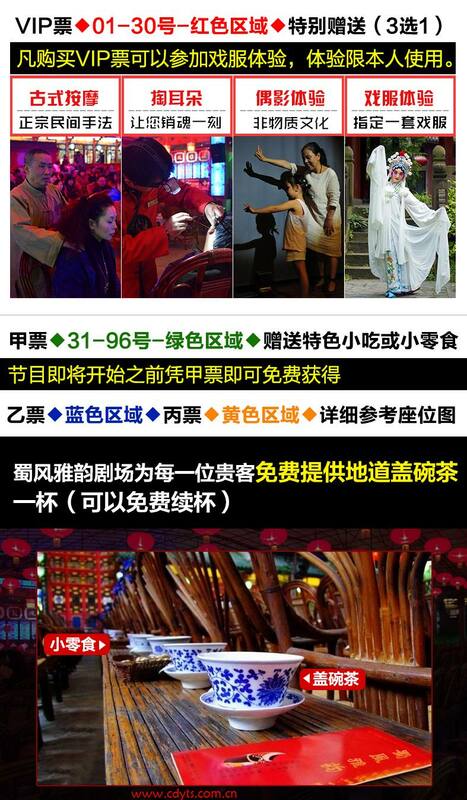 It is also the only one of its kind where you may enjoy the local tea, Opera and Arts shows in Sichuan Province. 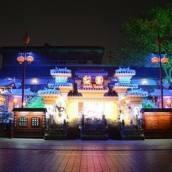 Featuring the Chinese traditional opera performances, unique talent shows, as well as opera costumes, exquisite handicrafts exhibits, the theater is just an ideal place for you to enjoy the local arts and culture. 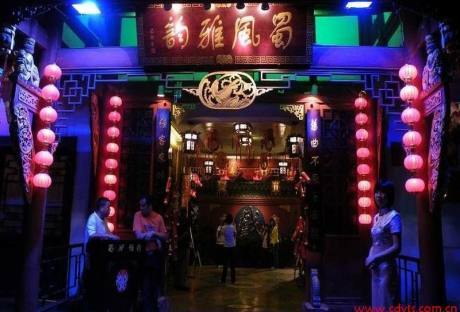 It has two Opera houses: Chinese Opera House (VIP House) and Liyuan Opera House, the former is much more expensive than the later. 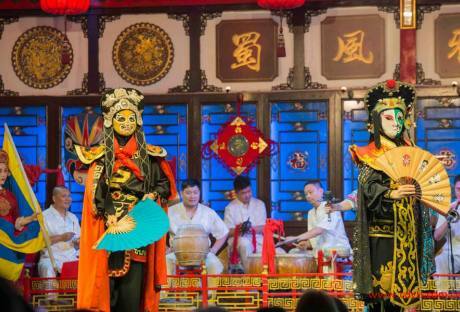 Functioned for over a hundred years, Shufengyayun has attracted distinguished performers from across Sichuan Province who will hold Sichuan Opera performances each evening. The show time is at 20:00 – 21:30. You’d better to go there a little bit earlier, for you have the chance to see how the performers make up, how they put their costumes on and even you can take some photos with them. B: 1, a bowl of tea, 2, souvenir, postcard. C: 1, a bowl of tea, 2, souvenir, postcard. Entrance address: No. 23, Qin Tai Road, Qingyang. After 16:30, if there is an extra admission time, 2 hours before the opening of the opening: 1 hour before the start of the performance, if there is an extra half hour before the opening of the opening, enter the park. It was amazing. The performance was very good. Pete liked puppets very much and recommended paying with Alipay. The performance was so wonderful that I had to recommend it to my friends.